West Chester Rustin could not cope with Coatesville’s speed and power, Friday night. 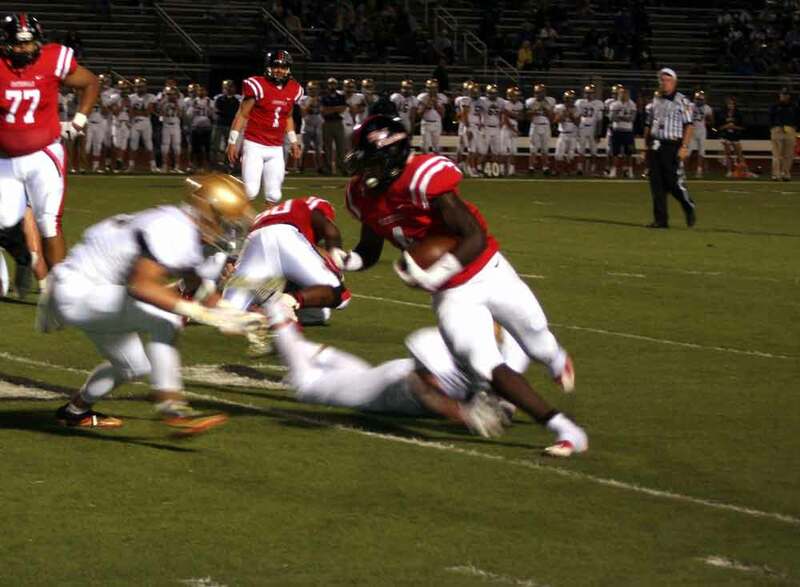 CALN — On paper, it should have been an interesting matchup: one of the top Ches Mont National Division teams, Coatesville, versus one of the top Ches Mont American Division teams, West Chester Rustin. But the gap between the two divisions showed clearly this past Friday night as the Red Raiders showed no mercy against the Golden Knights, totally dominating with a 49-0 win. Right from the start, Coatesville had their foot on the throttle by putting points up early in the game. With 5:51 left in the first quarter, Coatesville quarterback Ricky Ortega zipped a pass in to Aaron Young for the touchdown. Young would score most of Coatesville’s points as he displayed a man-amongst-boys type of game. Ortega himself had a great game with several completed passes, three touchdown passes, and many scrambling runs and quarterback keepers that racked up his rushing yards as well. However, the eye was on running back number four, Aaron Young. Running up and down the field it took at least three defenders to take him down on a run. The man could also do it all, give him the ball on a run and he will barrel up the middle and make his way for a first down and several times more. Or you could throw him the ball, like the 78 yard touchdown catch that got called back on a holding call. Extremely versatile player with a total of four touchdowns and over 100 rushing yards. Coatesville’s powerful defense kept the potent Rustin offense contained all night. Rustin had themselves a tough night as they were just outmanned by the bigger, faster, and stronger Coatesville team. As the fourth quarter began, the mercy rule was put into effect and the clock ran continuously for the rest of the game. Both teams took their starters out and the substitutions came in to play the rest of the game. Coatesville plays their next game against West Chester East away in West Chester Friday night at 7 p.m.
Rustin also plays Friday night in a conference game against undefeated Unionville out at Unionville’s home turf, the game starts at 7 p.m. 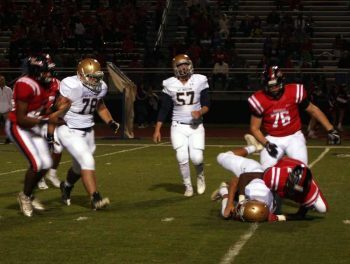 The Unionville-Rustin matchup has decided the American Division title for the past seven years (only those two teams have won titles this decade) — and is expected to again be pivotal.